A few days ago I write my review of English Whisky Chapter 13,14 and 15 and today I want to review with you their new additions to the range, their NAS Classic and Peated bottle. The idea behind this new range of whisky is,… well… you can read on their page. The point is to join again the wagon of NAS whisky… if Scotland is doing it, why not?! You all know what I think of NAS whiskies ( many of them are just for ripping you off… maybe not now but you will see… ) , but in this case I will do an exception and I will set my prejudices to a side, these whiskies are priced around £30 and they are both quite good ( with very ugly labels! ). One of two English Whisky Company 2013 releases intended to be widely available as an entry level offering. This is the unpeated version from the distillery, which became the first English whisky distillery to produce for over 100 years in 2006. Nose (88): more than average. honey, toffee, floral, citrus. Palate (89): powerful, oily. honey, fruity, pears, apples, citrus, vanilla. So based on other whiskies I have already tasted I rate this English Whisky Co. / Classic with 88 points over 100. 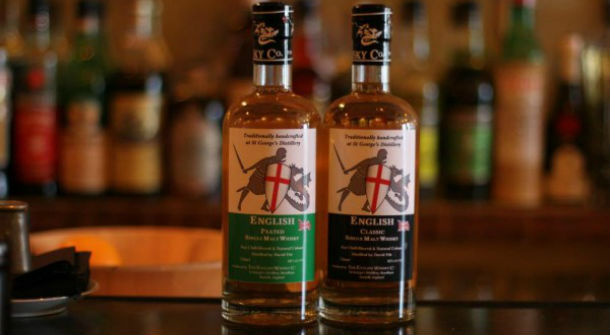 The peated edition of The English Whisky Company's 2013 releases intended to be widely available as an entry level offering. In 2006, the distillery became the first in England to produce whisky for over 100 years. Nose (90): more than average. peat, honey, citrus, vanilla. Palate (91): powerful, oily. floral, peated, honey, spices, wood. So based on other whiskies I have already tasted I rate this English Whisky Co. / Peated with 90 points over 100. If they keep this quality at this price, both of them are cracking suggestions. I particularly enjoyed the Peated one. Kudos to English Whisky for creating great whisky at a decent price.